I think it comes as no coincidence that Diwali - the HinduFestival of Lights, and Bonfire Night - the celebration of the failure of a 400 year old terrorist plot, are celebrated around the same time each year. Both signify the victory of good over evil. Both are celebrated with lights and fireworks. We prefer not to buy fireworks at home and instead choose to go to one of the many public fireworks displays dotted around the country at this time of year. This year, as part of our role as blogger ambassadors, we went to Drayton Manor Theme Park and Thomas Land for their spectacular fireworks display. There is a huge bonus if you choose Drayton Manor for their fireworks spectacular. You get to spend the day in the theme park enjoying all the rides before ending the day in sensational style watching the fireworks. For Drayton’s fireworks display this year is nothing short of magnificent. The theme is Star Wars. Anyone who is a fan of the franchise will instantly know what I’m on about. Even if you are not, take my word for it, you are in for an audio-visual treat. The creative minds at Drayton have coupled the fireworks display with a laser show. 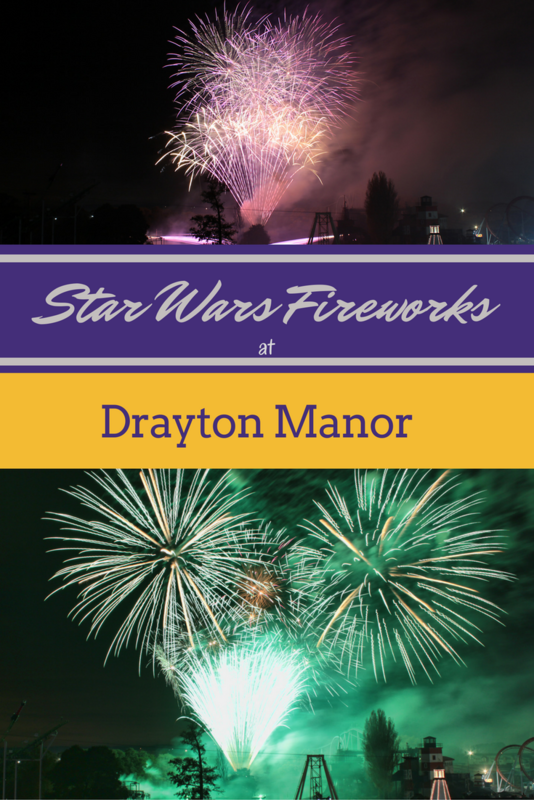 So you have stunning light effects to go with the Star Wars sound track and an array of vivid colours lighting up the night sky over Drayton Manor. We were witness to a truly eye-popping fireworks display at the park yesterday. The sounds, lights and colours perfectly complemented the glittering orbs of gold and silver that sparkled in the skies over the lake. It was the perfect way to kickstart our Diwali festivities. So whether you are celebrating Diwali, Halloween, Bonfire Night, all of these or none at all, if you enjoy spectacular visuals set to chart-stopping audios, do head over to Drayton to witness the magic for yourself. The display continues on the 29th and 30th of October from 7 pm. Last entry to the park is at 6pm, with rides open from morning till 9pm. Go on, make the most of this last weekend before school starts again. Disclosure: We were given free entry to the park as part of role as blogger ambassadors. All opinions are my own.